What Is The Recovery Like For Root Canal? Roo t canals are a type of endodontic procedure designed to save a patient’s natural tooth. An endodontic specialist or a general dentist treats an injured or infected tooth by cleaning the canals of the tooth root of their pulp and replacing it with a compound known as gutta-percha. This procedure has a success rate upwards of 90 percent and can make a dramatic positive difference in a patient’s oral health. However, if you’ve been referred to an endodontist for a root canal, it’s only natural to wonder what your recovery period will look like. We asked Dr. Jacqueline S. Allen, an endodontist who practices with the Phoenix Endodontic Group, to explain what most patients can expect after a root canal. Your root canal should lessen any tooth-related pain you have been feeling. Some extra sensitivity may remain if you were previously feeling pain from an infection or injury, but that should respond to over-the-counter or prescription painkillers. You will need to avoid chewing with the treated tooth at first. Your root canal will have a temporary filling on top of it to seal the canals, but until you receive a permanent restoration such as a crown, you will need to minimize chewing with the treated tooth. You will want to continue your usual oral self-care regimen. Brush twice a day and floss daily to maintain the health of your entire mouth. Follow your dental provider’s recommended schedule for follow up appointments once your restoration is in place. You may return to normal activities the day after your root canal. You should be able to return to work or participate in most types of recreational activities you may have scheduled. 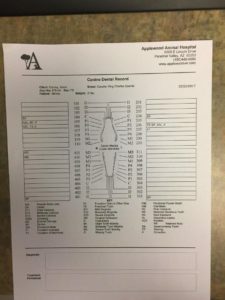 Despite advances in endodontic clinical technique and dental technology, not all root canals are successful. 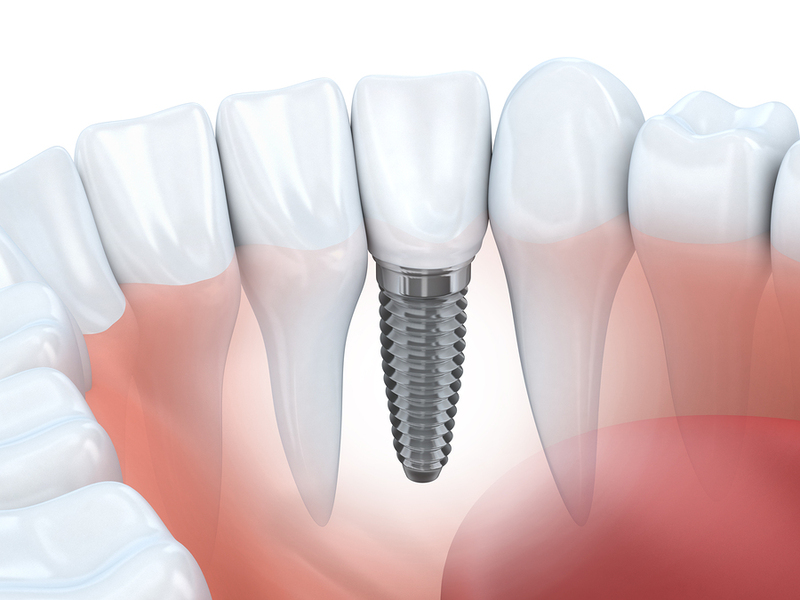 If a canal is not found and filled during the initial procedure, or if the tooth is challenged by a new infection or injury later on, you may need a root canal retreatment. It’s essential to alert your endodontist if discomfort returns to the tooth treated by the root canal. When you are trying to invest in something important – a car, say – it’s not enough to think about any type of motorized vehicle with four wheels that will get you from Point A to Point B. To get the best value for your money, you’ll have to think about how you live your life, what monthly payment you can afford, the size of your garage, and many other factors. That same sort of individualized thinking comes into play when you have an infected or injured tooth and need to see a dental professional to fix it. You most likely will need an endodontist, a dentist who is a specialist in saving natural teeth. But there’s more to finding a good endodontist than just looking for the word in a practice’s name. 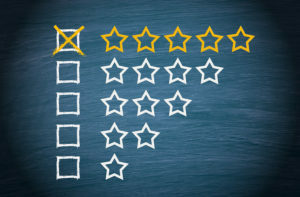 Here are just a few qualities you’ll want to look for as you “comparison shop” for endodontists, to find the best specialist to work on your mouth. Specialized training. Endodontists receive two to three additional years of schooling after dental school, but because the field changes so rapidly, a commitment to continuing education is a must. Membership in an organization such as the American Association of Endodontists can indicate a practitioner is invested in remaining up to date on their education. A commitment to your comfort. Endodontists are experts at managing pain and discomfort, even for patients who have had challenges in this area in the past. A good endodontist will focus on your comfort level and seek to maintain or improve it throughout all procedures that are undertaken. Skill with current technologies. 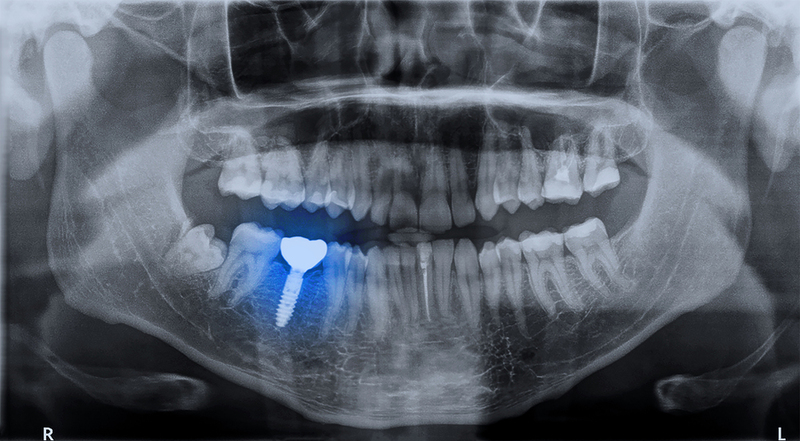 Technological breakthroughs have revolutionized root canal treatment in the past 30 years. An endodontist’s use of these tools can make your recovery from treatment quicker and help you experience less discomfort. A high experience level with endodontic procedures. General dentists perform, on average, two root canals per week; an endodontist may perform as many as 25. This translates into greater familiarity with different challenges and how to solve them. A wide network of professional colleagues. 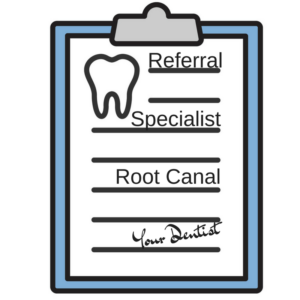 Collaborating with a network of general dentists, fellow endodontists and other dental specialists means your endodontist can accept and make referrals with ease if your case calls for one. “As endodontists, we are committed to pursuing the education, collaboration and professional excellence it takes to properly care for our clients,” says Dr. Jacqueline S. Allen, a partner with the Phoenix Endodontic Group. At Phoenix Endodontic Group, we believe our staff is what makes our practice so successful! As part of our employee spotlight series, this month, we are highlighting Sarah Apostolakis, one of our prized dental assistants! When not working, Sarah loves being active, “I love the ocean; surfing and snorkeling. I also enjoy hiking and camping.” She brings this same energy to her work. Sarah has experience in periodontics, oral surgery, and general dentistry. Changing negative views of dentistry to positive experiences is why she got into the field. Sarah’s passion for learning and gentle chairside assistance makes her a great addition to the team at Phoenix Endodontic Group. Our natural teeth are complex, dynamic parts of a living organism – us! Endodontists play a crucial role in allowing us to keep our natural teeth, which in almost all cases provides the safest and most optimal health outcome. According to the American Association of Endodontists, here are just some of the ways in which endodontists help your dental team preserve your natural teeth and keep them healthy for a lifetime. 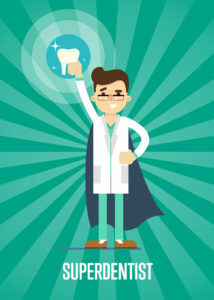 Endodontists partner with your general dentist. Endodontics is one of nine specialities recognized by the American Dental Association. 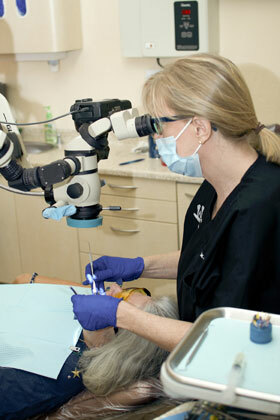 Endodontists partner with general dentists and other specialists in diagnosis and treatment planning. Endodontists are experts in performing root canals. The root canal procedure, which is often the only way to preserve a natural tooth, typically makes up 95 percent of an endodontist’s workload. They use advanced technology and microsurgical techniques to improve patient comfort and save natural teeth. Endodontists receive additional training and are experts in tooth root structure. To become specialists, endodontists receive two years of extra training after completing dental school. 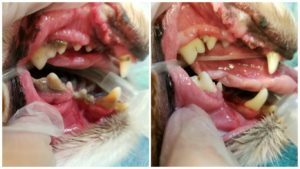 They gain the expertise to treat everything from the most common to the most unusual or complex tooth root problems, which diminishes the need for retreatment. Endodontists provide a solid foundation for other restorative work. A properly done root canal is an excellent platform on which to build a crown or other restoration. This makes it less likely a patient will experience future complications and have to pay for additional work on the tooth. 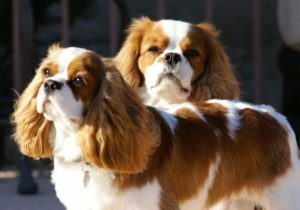 It has been awhile since we have posted any updates about our hard working office mascots – Winston & Minnie – Dr. Allen’s two King Charles Cavalier Spaniels. The bubba’s (as they are affectionately called) are doing just fine. Minnie just turned six years old and Winston will be seven years old in July. 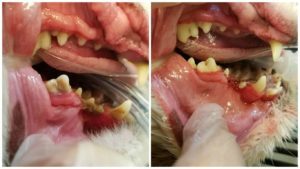 Last week it was time for the two scoundrels to have some much needed dental work performed and it reminded us that it is not just humans that need to have good oral hygiene – your pets need to have regular scheduled visits to the vet to check their oral health. We had known for some time that Winston & Minnie needed to have work done on their teeth. But as is human nature it was something we felt could wait. As their breath became more and more intolerable, we noticed that Winston was having trouble chewing his food. Once that happened, it was time to do something about it. 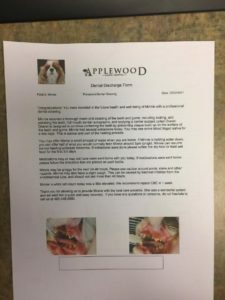 Enter Dr. Richard Reeves and his team at Applewood Animal Hospital in Paradise Valley, AZ. 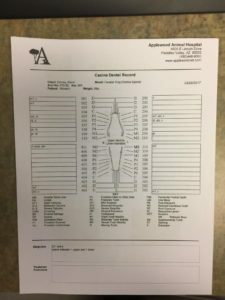 Dr Reeves and company made the whole experience easy for both the dogs and us. We are happy to report that after a day of recovery, both dogs are their old selves again – playing, chewing and being happy – as all dogs should be. 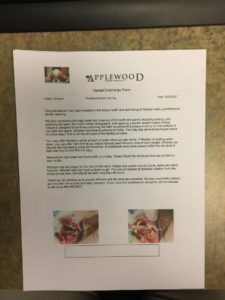 So what could have been a traumatic experience, turned into something that helped get these pups back to optimum health. Since we don’t have to worry about HIPPA for animals, I am able to post chart notes and photos from this experience. So Winston and Minnie are feeling good and will be happy to great you when you show up for a root canal at Phoenix Endodontic Group.